What is a Natural Swimming Pool/Pond or "NSP"? How do we Clean Water Without Chemicals? What do We Clean From the Water? What is Maintenance Like for a Natural Swimming Pool/Pond? Do our Biological Filters Ever Clog or Need to Be Cleaned Out? Do our Natural Swimming Pool/Ponds work in Really Warm Climates? Do Our Natural Swimming Pool/Ponds Work in Really Cold Climates? How Much Does a Natural Swimming Pool/Pond Cost to Build? How Much Does a Custom Natural Swimming Pool/Pond Design Cost? Can You Heat a Natural Swimming Pool/Pond? Can You Keep Fish in a Natural Swimming Pool/Pond? Do I Need a Separate Filter Pool or "Regeneration Zone"? Are Mosquitoes a Problem in a Natural Swimming Pool/Pond? Will Snakes Get in a Natural Swimming Pool/Pond? Do Natural Swimming Pool/Ponds Use Salt to Clean the Water? Can You Convert a Traditional Pool Into a Natural Swimming Pool/Pond? Can You Convert a Farm Pond into a Natural Swimming Pool/Pond? Yes, we can help you convert (or simply clean up) your pond! Contact us to get started! How Big (or Small) Can a Natural Swimming Pool/Pond be? Where Should You Put a Natural Swimming Pool/Pond in Your Yard? What's the average Energy Cost to Run a Natural Swimming Pool/Pond? Don't see your question answered above? Ask us your question below and we will email you back with an answer as soon as we can (please allow up to one week). 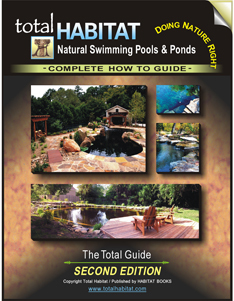 Our newly updated eBook has all you need to create your own Natural Swimming Pool or Pond! Our new edition is packed with detailed information, formulas, and over 80 illustrations, photographs, and Step-by-Step examples. Learn the concepts and design your own Natural Swimming Pool or Pond confidently!